NBC Nightly News aired a story tonight about our friend Ryan Langston; the young boy born with Down syndrome that both Target and Nordstrom used as a model in some of their adverting campaigns. Here’s an extended edition of the NBC Nightly News’s interview with the Langston’s. Check it out. I’m thrilled to see all of the recent media attention about those, like our son, who are born with Down syndrome. 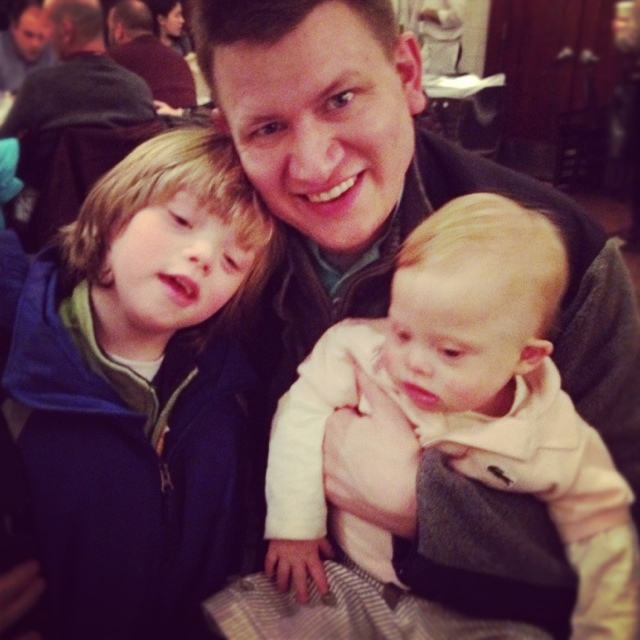 What do you think about all of the recent media attention Down syndrome? When will little Noah make the news? I think it’s about time!! I’m really excited for all the attention Down Syndrome is getting right now. I really hope that all this mainstream media attention succeeds in dispelling people’s fear; people’s hesitancy. In the past kids with DS were hidden and not talked about, and because of that there is a lot of misinformation and myths that were guessed at because no one talked about it. Even when Warren was born 6 years ago we were told at the hospital “Don’t put him in an institution, kids like him can lead full lives today”. It never even crossed our minds; my husband was so confused because he thought they were saying we shouldn’t send Warren to college. I hope that this can lead to, “Congratulations, your child is here and is beautiful, and has Down Syndrome” rather than, “I’m so sorry to tell you, your child has Down Syndrome”. I hope that we can get to a point as a society that inclusion is so natural that no one is ever told their child can’t be dropped off with all the other kids, but has to be escorted to the special ed room so the aide can take the child to the classroom 5 minutes later. I hope that this attention changes people’s approach. I don’t think it’s fair that because of down syndrome a child has to behave better than their typical peers before they can be included; people (even special education teachers) start with the idea that the child is excluded until they earn it. I think that the audiences reached by shows such as the nightly news are the most important views to change, because toddlers don’t know to discriminate, it’s learned from adults behavior. Stephanie, your post is beautiful! I remember the words our doctor spoke to us after my amnio – “I’m sorry, I wish I had better news for you”. To this day those words haunt me. It angers me that many people in the medical community still has a negative view of people with Ds. Doctors need to be positive or at least neutral when delivering a dx such as this. It’s wonderful that society is becoming more accepting of people with Ds… now if we can just get the medical community to do the same….. I think the positive publicity is great! I have a almost 12 month old grandson with DS and in Australia there seems to be very little public awareness of DS, people generally (including some medical professionals) seem to have a very outdated view of DS and have low expectations of those wtih DS – my little grandson is a great blessing and joy to us. He has had some health issues, and needed heart surgery, however through him my daughter and son-in-law have met some wonderful caring people who have given them great support. This generation of children with DS are going to totally change the outdated prejudice of people and show what they are truly capable of. Keep up the good work – you are amazing parents!! Watching this, I am struck by the fact that it is so clearly shown that Ryan is a typical kid! He’s funny, a little narcissistic in that way only little kids can get away with, and NORMAL. His story is exactly the type that is going to change the outdated notions of Down syndrome. The positive publicity is fanastic and is raising great awareness. My hope is that it results in saving lives, because our culture has bought into the idea of choosing the type of child you have, and the majority don’t choose life for Downs. There is a lot of work to do, but together, we can turn this around. Again, while I don’t have a child with Down syndrome, I truly enjoy that all of these beautiful children are finally getting the attention they deserve! We use this site as an example to show our son of how people can be different, but, very much the same. He absolutely adores baby Noah and cheers for him as he’s learning new things! Thank you for sharing him with the world! Great coverage – the interview goes a long way to break down the commonly held stereotypes – it clearly shows Ryan is a great kid first and the fact that he has Down Syndrome is only secondary! Im so very glad to see this. Im new to the DS community and am very happy that I found your site Rick! It gives new parents hope, knowledge, and sets us at ease. It even gives us a sense of belonging. We are so proud of Ryan and Noah! I cant wait to see more on the news. First of all CONGRATULATIONS ON YOUR NEW BABY BOY!! SECOND…..I read your post and shared it with my wife the second I saw it! My wife is a pediatrician and it warms our heart that your doctor did that. You’ll have to ask how he found out about us..and let him know if we can ever help him my wife (or I) would be GLAD to! He is doing a great thing. We are so glad you found our site, and took the time to introduce yourself! How is everything going with your little one health wise? And how are you guys doing? Have you seen our new parent guide? LOVE the interview! Ryan is too cute! Are you a star? Oh yea! I totally agree! I hope more and more news organizations run stories like these. We were so thrilled to see the piece on NBC about Ryan, and particularly tickled to see your web site in the background! WOOHOO! We are getting the right kind of attention for a change! You rock, and we appreciate it! It is such an inspiring story!! Diego is my 6 yr. old son with Down Syndrome and I see so much of him in your son. We are glad to say we haven’t experienced many health issues; however, school has been a serious situation in which we are still struggling with. As a kindergartener, we really want to pursue inclusion and have Diego experience the most least restrictive environment possible, meaning regular education. However, the school district doesn’t agree with us and here is where, as parents, we have to be the best advocates Diego can have. He is a high functioning kid and I know, as a teacher myself, he would benefit tremendously from the speech models and behaviors in a regular education setting. So just know that this is a never-ending journey but we love the fact that society can embrace, welcome, and learn from our children with special needs. I really appreciate your website and look forward to staying in touch! This has been so exciting! “Daddy Blogger” ! It’s great that you did blog this. I don’t know where all this will end up, but right now it just looks like this message of inspiration is truly inspiring so many people. We made sure to call, text, email, and facebook everyone about Nightly News and so many people saw it. We are so glad people are eager to learn about Down syndrome and be INSPIRED by your story, Ryan’s story and even our story! God Bless You! Thanks guys! You are epic parents! Every time you post about Ryan, I just ball, really cry like a baby! I have loved Maddison (my girl) since the moment we found out we were pregnant. Seeing Noah grow up and watching what you do makes me beam with joy, happiness, and since of pride! It’s a good time to have a child with Down syndrome. With everything you do to bring awareness, I hope the world will except my Maddison with open, loving arms! Truely we adore your family! I like the extended version. No love for Noah’s Dad on the first one. All of the parents of children born at this time are so lucky to have the help available. As a sister of a recently passed away 59 year old brother with Down Syndrome all I can say is be thankful there is the kind of help out in the community. My brother went to an institution when he was 3-1/2. My family did keep in contact with him, they didn’t just leave him and walk away as many parents did in the past, so I was able to keep in contact with him and eventually took over guardianship of him. He was deaf and mute and yet I firmly believe he could have been much higher functioning with the proper care and services if they had been available 60 years ago. I actually can remember my 3rd grade teacher telling me I was so brave in admitting that I had a “mongoloid” in the family. I was once asked how we communicated with him, and all I could answer was “we just do”. I miss that funny guy so much, but he was always a little boy in a big boy’s body, mostly because not enough was done early on. Thank God you have the interventions you do. I didn’t love him any less because he didn’t have the chance to develop to his full potential, but it still would have been nice to have him as high functioning he could have been. There is no love like that of a person with Down Syndrome. Margaret, I am so sorry for the loss of your brother, you have my condolences. When my daughter was born with Down Syndrome 35 years ago, we were told to “put her in an institution, go home, and forget you ever had her. She’ll never walk or talk”. That stunned me far more than the diagnosis and emotional upheaval! 35 years later, she has finished high school with her class, has held the same job for 13 years, and just a couple of years ago, took on a second job. She will most likely live at home with us for a good long while, but I am SOOOO thankful that I chose to ignore that doctor and do what we felt was right. There’s been a lot of progress in the past 35 years, but there’s always room for more! Thank you for sharing your story. God Bless You!! I am always so pleased to see persons with disabilities of any kind put in the spotlight with a positive spin. I have a 35 year old daughter with Down Syndrome, and while I have seen TREMENDOUS progress over the years, there’s always room for more! I remember when Sesame Street introduced their newest person in the 80’s; a young boy with Down Syndrome, he was on Sesame Street for quite a few years. I remember my daughter shouting from the living room ‘LOOK MOM!!! HE’S JUST LIKE ME!!! COME LOOK, MOM” This from a 7 year old who, we had been told, would never walk or talk. In her teen years, we followed the series “Life Goes On” with Corky, and it certainly helped her outlook and self esteem to see people “just like her” in the public eye. I just love Noah’s Dad!! What Awesome parents Ryan has! I am so encouraged by what they have to say and to see Ryan! They have 2 beautiful boys! I agree! They are really great! Do you have children? If so, were any of them born with Down syndrome? Yup, Colton has DS(the little guy in my pic). He’s 17 months, a few months younger than Noah. I also have a 4 yr old Nathan. Nice to meet you guys! How did you find out about our site? A good friend shared the target ad story on facebook. Between you guys and ‘Bringing the Sunshine’, I feel more connected to Colton’s peers. We have a great group of parents all with kids Nathan’s age, but we haven’t had as much luck to make friends for Colton. We’re not too far from the Down Syndrome Connection of the Bay Area in Danville, CA, but still far enough that it’s more difficult to make it their programs.